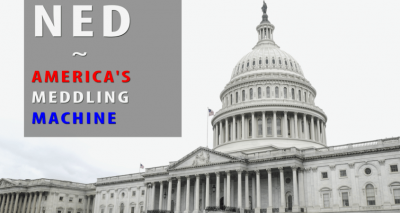 Filmed inside the Capitol, this Grayzone special explores the National Endowment for Democracy, a taxpayer funded organization that has interfered in elections, mobilized coups, and orchestrated public relations campaigns against nations that resist Washington’s agenda. Founded in 1983 by then president Ronald Reagan, the National Endowment for Democracy became an international vehicle for the neoconservative agenda. Its founding cadre were Cold War ideologues who were, like so many early neoconservative operatives, former Trotskyists who once belonged to the Social Democrats USA party. Image on the right: In 2014, in partnership from libertarian tech billionaire Peter Thiel, Halvorssen launched the deliberately provocative “Hack Them Back” campaign to disrupt inter-Korean peace talks. During the NED ceremony, Democratic House minority leader Nancy Pelosi recalled a trip she took to Pyongyang, the North Korean capital. Pelosi then claimed that locals were executed on the spot for unauthorized corn consumption. “They would get shot if they just took one corn on the cob, one husk of corn,” she claimed. Philip Agee, the late CIA whisteblower, described the work of the NED as a more sophisticated version of the old-fashioned covert operations that Langley used to engineer. At the NED ceremony, I spoke to an IRI staffer, Alexander Moree, who presented the group’s work in Mongolia as a blueprint for a post-communist North Korea. Carl Gershman founded the National Endowment for Democracy. He’s neoconservative activist with roots in Trotskyism. Today, Gershman still embraces the ideology of permanent worldwide revolution. But with peace looming on the Korean peninsula, Gershman was forced to reassure his grantees that their work for regime change would not become irrelevant. In the Longworth hallway outside of the NED event, I asked Nancy Pelosi if she thought the US government should stop funding organizations that seeking regime change against North Korea if it signed a peace treaty with the South. I then asked if she considered NED activities to be the same sort of foreign meddling Russia is accused of carrying out in the US. “I’m not going into any hypotheticals,” she said, dismissing the issue out of hand.